As all the Nifty results have trickled in, we have a P/E ratio for the Nifty on a consolidated basis (NSE only gives us standalone). The P/E ratio is now 21.45 at the Nifty level of 10656. Earnings growth on a consolidated basis is about 11%. This is fairly decent. 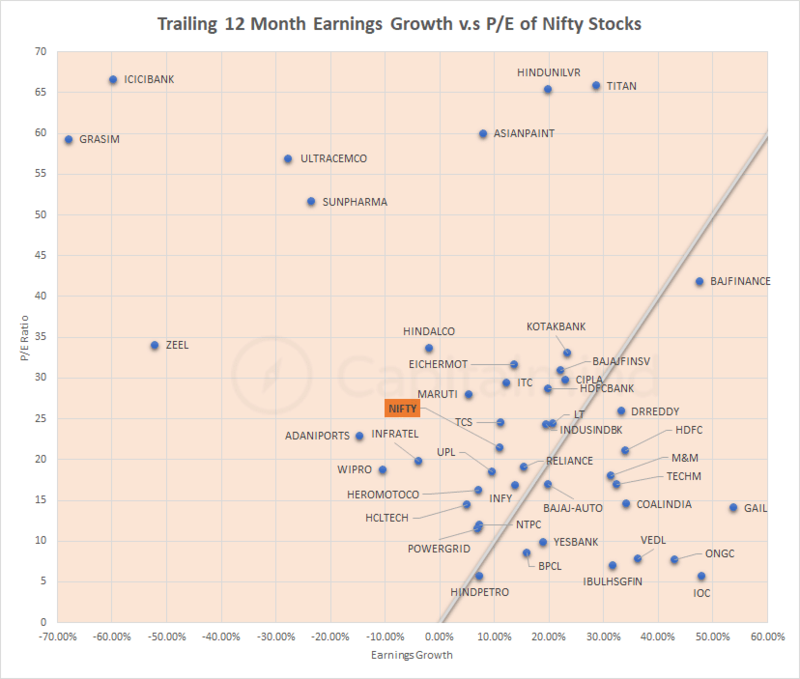 The line on the pic is the 1:1 line for earnings growth = P/E. So anything below or to the right of the line is growing faster in earnings than the P/E number. Stocks like Bajaj Finance have P/E of 40+, but to be honest, it’s also delivered growth of 40%. A P/E of 21 isn’t too high, but isn’t low either. But a return to double digit growth is a good sign, and lets hope it sticks!